Maria Amalia of Saxony (Maria Amalia Christina Franziska Xaveria Flora Walburga; 24 November 1724 – 27 September 1760) was Queen consort of Naples and Sicily from 1738 till 1759 and then Queen consort of Spain from 1759 until her death in 1760, by marriage to Charles III of Spain. A popular consort, she oversaw the construction of the Caserta Palace outside Naples as well as various other projects, and she is known for her influence upon the affairs of state. Moving to Spain in 1759, she then set about the improvements to the Royal Palace of Madrid but died before its completion. Maria Amalia was politically active and openly participated in state affairs in both Naples and Spain. She was born at Dresden Castle in Dresden, the daughter of Augustus III of Poland, Elector of Saxony and Maria Josepha of Austria, herself daughter of Joseph I, Holy Roman Emperor. Her mother was the first cousin of Empress Maria Theresa. The infant was baptised with the names Maria Amalia Christina Franziska Xaveria Flora Walburga, but known as Maria Amalia. One of 15 children, she was the sister of Frederick Christian, Elector of Saxony, Maria Anna Sophia of Saxony wife of her cousin Maximilian III Joseph, Elector of Bavaria; she was the older sister of Princess Maria Josepha of Saxony who was the mother of Louis XVI of France. Her youngest sister, Princess Kunigunde was a possible wife for the future Philippe Égalité. She grew up at the court of Dresden and was educated in French, dance and painting. She was also an accomplished musician and sang and played the keyboard from an early age. In 1738 Maria Amalia became engaged to Charles, King of Naples and Sicily, the future Charles III of Spain. The marriage was arranged by her future mother-in-law Elizabeth Farnese, after Elizabeth had failed to arrange a marriage of Charles to Archduchess Maria Anna of Austria, and refused to agree to have him marry to Louise Élisabeth of France. The impenetrable secret negotiations had taken place earlier in Vienna, where the Dowager Empress Wilhelmina Amalia, grandmother of Maria Amalia, played an important part in the negotiations. The Spanish ambassador in Vienna, Count Fuenclara, acted on behalf of the courts of Madrid and Naples, while the Italian banker Giovanni Battista Bolza represented the interests of Dresden court. In December 1737, a papal dispensation was made, and the marriage announced in the beginning 1738. On 8 May 1738 Maria Amalia had a proxy ceremony at Dresden with her brother, Frederick Christian of Saxony, representing Charles. Since this marriage was looked upon favorably by the papacy, it soothed the diplomatic disagreements between Charles and the Papal states. On 4 July 1738 Maria Amalia arrived at Naples and to what was described as a euphoric welcome. The couple met for the first time on 19 June 1738 at Portella, a village on the kingdom's frontier near Fondi. At court, festivities lasted till 3 July when Charles created the Royal order of San Gennaro – the most prestigious chivalric order in the kingdom. He later had the Order of Charles III created in Spain on 19 September 1771. Despite being an arranged marriage, the couple became very close: it was noted and reported to her mother-in-law in Spain, that Charles seemed happy and pleased when he first met her. Maria Amalia was described as a beauty and as a skillful rider, and she accompanied Charles on his hunts. As Queen, she exerted great influence upon politics despite her frequent illnesses, and she actively participated in state affairs. She ended the careers of several politicians she disliked, such as J.M. de Benavides y Aragón, conte di Santisteban; Y.Y. de Montealegre, marchese di Salas; and G. Fogliani Sforza d'Aragona, marchese di Pellegrino. Her displeasure led directly to the latter being deposed as prime minister. Maria Amalia did not need to keep her influence secret: after the birth of her first son in 1747, she was given a seat in the council of state. She worked against the Spanish influence on Naples and in 1742 convinced Charles, against the will of Spain, to declare Naples neutral during the War of the Austrian Succession, during which Britain threatened to bomb Naples. In 1744, however she was forced to agree to declare war. She then favored Great Britain before France and Austria. Maria Amalia was talked about because of her favorites, which were to have influence over her policy when she was very ill, such as princess Anna Francesca Pinelli and duchess Zenobia Revertera. In 1754, she supported the career of Bernardo Tanucci as Foreign Minister. Maria Amalia was very cultivated and played an important role in the construction of Caserta Palace, for which she saw her husband lay the foundation stone for on his 26th birthday, on 20 January 1752 amid much festivity. However, they left Naples before its completion due to her declining health so they never actually lived in the palace. She also was influential in the building of the Palace of Portici (Reggia di Portici), the Teatro di San Carlo – constructed in just 270 days – the Palace of Capodimonte (Reggia di Capodimonte); her husband also had the Royal Palace of Naples renovated. Her apartments at Portici were home to the famous porcelain from the Capodimonte Porcelain Manufactory which she who introduced the production of Porcelain in Naples in 1743. She was also a heavy user of tobacco. Maria Amalia was also a patron of the composer Gian Francesco Fortunati, a favorite at the Neapolitan court. She was criticized for being too religious from what was proper from someone not a member of a Catholic monastic order: she attended mass twice and eventually four times a day and kept more devotions than what was normal for a nun or a monk, and he eventually lectured her that she was more fervent than what could be regarded as modest for a lay person. At the end of 1758, Charles' half brother Ferdinand VI was displaying the same symptoms of depression from which their father used to suffer. Ferdinand lost his devoted wife, Infanta Barbara of Portugal in August 1758 and would fall into deep mourning for her. He named Charles his heir on 10 December 1758 before leaving Madrid to stay at Villaviciosa de Odón where he died on 10 August 1759. At that point Charles was proclaimed the King of Spain under the name of Charles III of Spain; in respect of the third Treaty of Vienna, which stated should he become King of Spain he would not be able to join them to the Neapolitan and Sicilian territories. He was later given the title of Lord of the Two Sicilies. That same year they left Naples for Madrid, leaving two of their children behind in Caserta. Her third-surviving son became Ferdinand I of the Two Sicilies, while his elder brother Carlos was groomed in Spain to inherit the Spanish crown; their oldest brother, Infante Felipe, Duke of Calabria was mentally retarded and was thus taken out of the line of succession to any throne; he died quietly and forgotten in Portici where he had been born in 1747. The right of succession to Naples and Sicily was reserved for her second son Prince Ferdinand of Naples and Sicily; Prince Ferdinand would stay in Italy while his parents were in Spain. In favour of that, Charles would abdicate on 6 October 1759, decreeing the final separation between the Spanish and Neapolitan crowns. 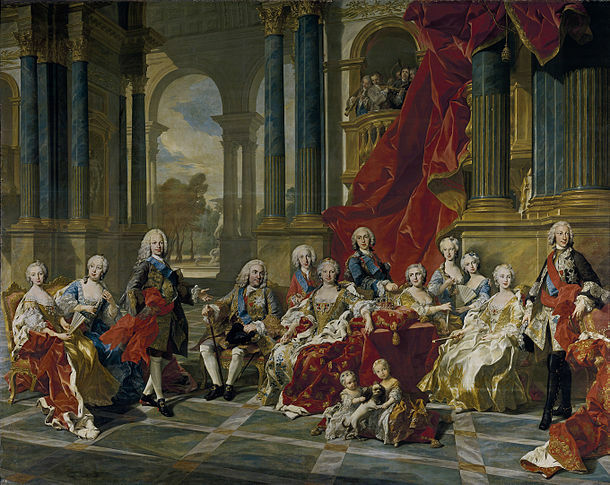 Charles and his consort arrived in Barcelona on 7 October 1759. In September 1760, a year after arriving in Madrid, Maria Amalia suddenly died at the Buen Retiro Palace outside the capital. She was buried at the Royal Crypt in El Escorial. She was joined by her devoted husband in 1788. In 1761, Charles commissioned Giovanni Battista Tiepolo to paint frescoes for the Royal Palace in Madrid. In the Queen's Antechamber, Tiepolo and his assistants painted the Apotheosis of the Spanish Monarchy. The frescos were painted from 1762–1766. Queen Maria Amalia appears surrounded by several of the gods of Greek mythology, including Apollo. Prince Ferdinand became King of Naples and Sicily, at only eight years old, under the name of Ferdinand IV of Naples and as Ferdinand III of Sicily; in order to consolidate the alliance with Austria, he was destined to marry an Archduchess of Austria. Charles left his son's education and care to a Regency Counsel which was composed of eight members. This counsel would govern the countries until the young king be 16 years old. The Archduchess came in the form of Maria Carolina of Austria. The two would have 18 children. Her descendants include today's King Juan Carlos I of Spain, Archduke Otto of Austria, Prince Henri, Count of Paris along with The Prince Napoléon as well as the two pretenders to the throne of the Kingdom of the Two Sicilies, Prince Carlo, Duke of Castro and the Infante Carlos, Duke of Calabria. Princess Maria Isabel (Portici, 6 September 1740 – Naples, 2 November 1742) died in childhood. Princess Maria Josefa (Portici, 20 January 1742 – Naples, 1 April 1742) died in childhood. Princess María Isabel Ana (Capodimonte, 30 April 1743 – Capodimonte, 5 March 1749) died in childhood. Princess María Josefa (Gaeta, 6 July 1744 – Madrid, 8 December 1801). Princess Maria Luisa (Portici, 24 November 1745 – The Hofburg, 15 May 1792) married Leopold II, Holy Roman Emperor and had issue. Prince Felipe, Duke of Calabria (Portici, 13 June 1747 – Portici, 19 September 1777). Charles IV of Spain (Portici, 11 November 1748 – Palazzo Barberini, 19 January 1819 married Maria Luisa of Parma and had issue. Princess Maria Teresa (Royal Palace of Naples, 2 December 1749 – Portici, 2 May 1750) died in childhood. Princess Maria Ana (Portici, 3 July 1754 – Capodimonte, 11 May 1755) died in childhood. Prince Francisco Javier (Caserta, 15 February 1757 – Aranjuez, 10 April 1771, died in childhood. ^ Harold Acton, I Borboni di Napoli (1734–1825), Florence, Giunti, 1997.